ENMET August 2018 Newsletter – Come See Our Compressed Airline Monitoring Systems at the Best Practices Expo in September! ENMET is excited to be exhibiting at the inaugural Best Practices 2018 Expo & Conference for Compressed Air, Vacuum and Cooling. We will be featuring our complete line of compressed airline monitoring and filtration systems. We offer systems for many applications including monitoring and filtering supplied breathing air, monitoring hospital compressed air systems, and monitoring compressed air in manufacturing processes. Our compressed airline carbon monoxide (CO) monitors are designed to meet OSHA monitoring requirements for Grade D breathing air and NFPA 99 “Medical Air Systems Guidlines”. Please stop by and speak with one of ENMET’s knowledgeable team members and learn more about our compressed airline monitors. 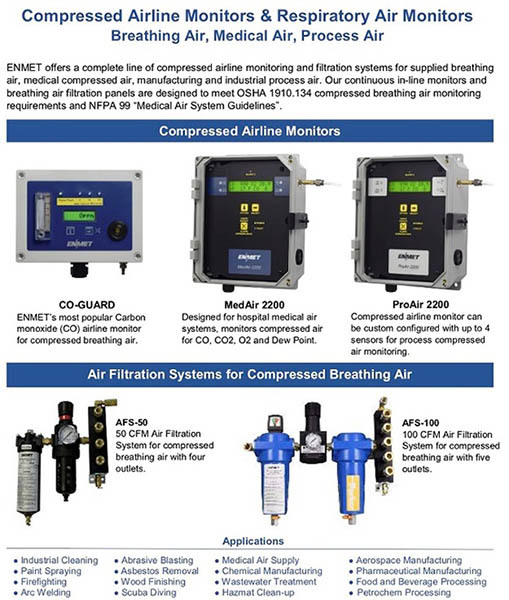 0 comments on ENMET August 2018 Newsletter – Come See Our Compressed Airline Monitoring Systems at the Best Practices Expo in September!